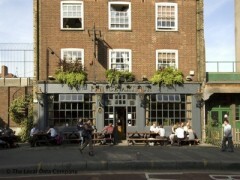 About: The Prince Arthur is a small friendly pub that serves a selection of real ales, beers, wines, spirits. They have Sky TV and live bands at weekends. Seating on the pavement area is provided, weather permitting. Who’d have thought a cosy neighbourhood pub would act as a beeline to the stars? It’s always the quiet ones and with Michael Fassbender, Will Young and Dominic Cooper all spotted in the gastro hideout, The Prince Arthur makes a big celeb spotting noise. The Prince Arthur is a regular pub that happens to host some excellent live jazz events throughout the month. The cosy Euston pub might look like the kind of place you’d expect to find jazz but that’s the charm. Enjoying a pint never felt so refined.